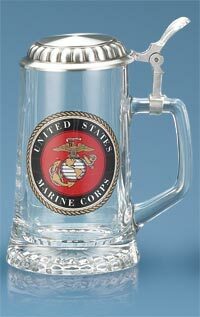 A United States Marine Corps emblem decorates the tapered, smooth, sturdy glass body. A starburst light-reflecting pattern decorates the bottom and the smooth heavy gauge lid is removable! Perfect for personalizing on the body or the lid. The stein has a special threaded hinge pin. The lid is easily removed and reattached by simply tightening and loosening the hinge pin with a screwdriver.